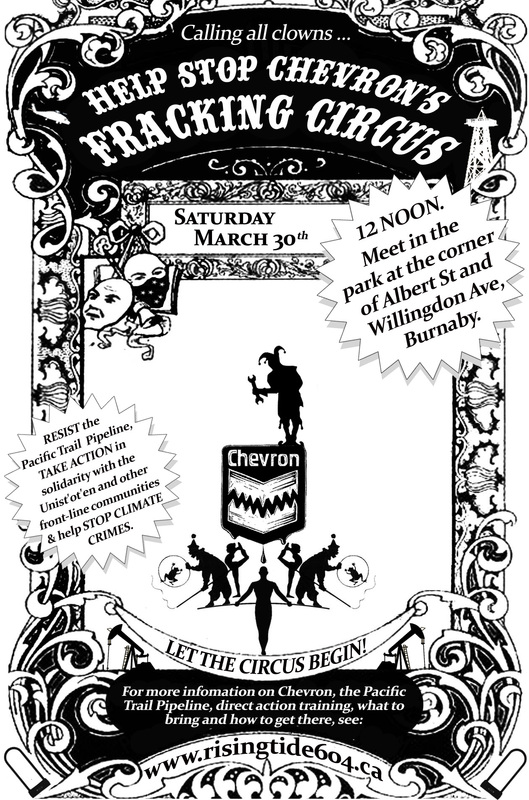 Vancouver Action – Chevron’s Fracking Circus: A ‘Closing’ Act. Calling all acrobats, jugglers unicyclists and clowns to RESIST Chevron and the Pacific Trail Pipeline! On Saturday March 30th, 2013, Rising Tide Vancouver, Coast Salish Territories will be joining the many voices who oppose Chevron’s dangerous and exploitative tycoonery in a global day of action against the multinational corporation http://calamites.resist.ca/?p=347. Meet 12 Noon, in the park at the corner of Albert St and Willingdon Ave, Burnaby, BC. EASY TO GET TO … Take the #135 bus going east on Hastings Street, get off at the Willingdon Avenue stop. Head North on Willingdon (about two minutes). 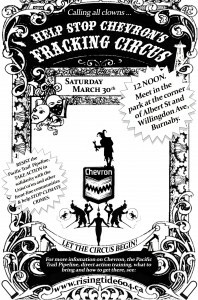 Our action will take the form of a circus, in the park across from Burnaby’s very own Chevron Oil Refinery at 355 Willingdon Ave N. There we will meet their callous greediness with a resistance couched in circus themed revelry. We will be serving some food, but recommend you bring some of your own. There will be music, events and fun circus acts! Save the date and don’t be late. We will meet at the Confederation Community Centre together, and march to the park on the corner of Eton and N Wellingdon Street, across from the refinery. The rest will be up to the clowns! By Bike: Follow the Adanac/Union bike trail headed east until Willingdon Avenue. Turn left and cycle past hastings st. Destination on your right. By Bus: Take the #135 going east on Hastings Street, Get off at the Willingdon Avenue stop. Head North on Willingdon (about two minutes), community centre will be on the right. By Car: East on Hastings, North on Willingdon. Let us know if you have room to carpool!